Glen Shiel in Kintail is a hillwalking paradise with high mountain ridges bounding both sides of the glen offering fantastic high-level ridge walking that stretches all the way to the west coast. These ridges give the chance to link several summits in a day with relatively small drops between the tops. The views range from the high peaks of Lochaber to the Cuillin of Skye and beyond with the rugged peaks of the Knoydart peninsula close at hand. There are also more than 20 Munros in the immediate vacinity, so its a place that can really helps to boost your Munro count! 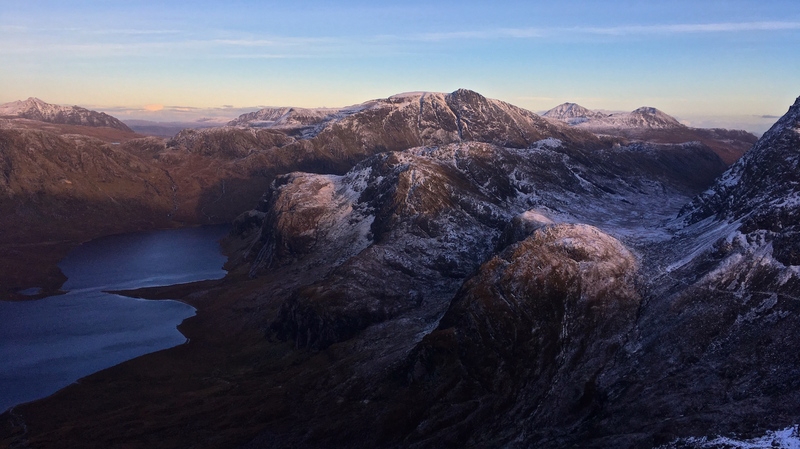 On this trip we’ll aim to climb 10 of the area’s Munro summits over 3-days, splitting the South Glen Shiel Ridge down into two manageable chunks, then attempting the well-known traverse of the Five Sisters of Kintail on day 3. Note that in mid-March it is likely to still be full-winter conditions in the hills, so winter kit including ice axe, crampons and winter boots will be required for this trip. A winter kit-list is available here. This day tackles the four eastern Munros of the South Glen Shiel Ridge and gives a fine introduction to walking in Kintail. Starting from the Cluanie Inn, the walk-in initially follows the old road to Tomdoun. This track gives easy access to the base of Creag a’ Mhaim’s southeast ridge from where a old stalker’s path provides a pleasant walk up to the first Munro summit, with great views across Glen Loyne into the wild northern corries of neighbouring Munros, Gleouraich and Spidean Mialach. Once the height is gained, we stay high for the rest of the day, following the ridge as it snakes westwards over Druim Shionnach, Aonach Air Chrith (the highest peak on the ridge) and Maol-chinn Dearg, with a little easy scrambling along the way. A straightforward ridge leads, with another good stalkers path lower down, leads due North and straight back to the main road in Glen Shiel, where a car can be left for the short distance back to Cluanie. On Day 2 we’ll pick-up where we left off the day before. Starting from the main road in Glen Shiel, the ridge of Druim Thollaid runs parallel to day 1’s route of descent and gives access to the South Glen Shiel Ridge at the top of Sgurr Coire na Feinne (902m). Here we turn west again and, after a short descent, head up to Sgurr an Doire Leathain – Munro #1 of the day. This top gives fine views ahead to Sgurr an Lochain, which is with-out doubt the most impressive top on the ridge. Despite appearances, it is a straightforward ascent to the second Munro of the day. The final Munro, Creag an Damh lies a couple of kilometres further on and is easily reached with the option to go over the subsidiary top of Sgurr Beag en route. There are a couple of descent options from here, but it is best to follow the continuation of the ridge further west, with a little more easy scrambling, to reach the Bealach Dubh Leac, where another stalkers path provides good access back to Glen Shiel. The traverse of the Five Sisters of Kintail is something of a classic hillwalk! Taking in 3 Munros and several other dramatic tops, it offers more high-level ridgewalking with fantastic views of both mountain and sea, with the western end of the ridge dropping straight down to the head of Loch Duich, a sea loch off the Atlantic. To the north there are great views to Glen Affric and the Northwest Highlands. The ridge is gained by a steep ascent to the Bealach an Lapain. At 725m this is the lowest point on the North Glen Shiel Ridge. Heading west from here, a fine ridge leads to Sgurr na Spainteach, the Peak of the Spanairds, where there are good views to the Munros ahead. A short descent with a little easy scrambling leads to the next bealach and each of the next three summits reached are Munros. The third and final Munro, Sgurr Fhuaran, is the highest and is a commanding viewpoint. A steep descent leads to the last section of the ridge, where the subsidiary tops of Sgurr nan Saighead (929m) and Beinn Bhuidhe (869m) give nice walking with impressive views down the craggy north side of the ridge into the deep glacial valley of Glen Licht. From Beinn Bhuidhe a good path leads down by the dramatic waterfalls of the Allt a’ Chruinn to the village of Morvich, where cars can be left for the return to the days start point.